The majestic bird, which was restored as the country’s official emblem in the early 1990s after the collapse of the Soviet Union, traces its origins to the Byzantine era. Although 23 years have passed since the collapse of the USSR, in the minds of many foreigners the Soviet-era hammer and sickles still a symbol of Russia. However, Russia's current state emblem is completely different, and its history dates all the way back to the times of the Byzantine Empire. The state emblem of the Russian Federation - the double-headed eagle - happens to be one of the oldest Indo-European symbols. Its history is a mixture of Christianity, Paganism, Zoroastrianism, the epochs of great empires and those of feudal fragmentation. Entire states and civilizations vanished, but the double-headed eagle continued to soar above the people of Western Asia and Eastern Europe. Here's how it evolved. The double-headed eagle first appeared on the coat of arms of the great Hittite Empire, which occupied the territory of present-day Turkey in the 17th-12th centuries BC. In the early Middle Ages Europe's climate was much warmer than it is today. For example, in the 12th century lions and leopards could be found in southern Ukraine. Killing a lion was a sign of valor. Only Grand Princes and selected members of the aristocracy were allowed to participate in this hunt, which gradually made this animal a heraldic symbol of nobility and courage. There it was later adopted by the heir of the Roman one-headed eagle, the Byzantine Empire. It shortly became the symbol of Eastern Christianity and then spread across Christendom, appearing on the coats of arms of Serbia and Montenegro, Germany (the Holy Roman Empire) and Armenia. The eagle "flew" over to Russia only in the 13th century, replacing the trident - an ancient symbol of the ruling dynasty. First the double-headed eagle appeared in Chernigov, in present-day Ukraine, then in Vladimir (176 km west of Moscow), then in Moscow itself. After the fall of the Byzantium Empire in 1453, Russia was left the only independent Orthodox country in the world. The eagle subsequently became Russia’s main official symbol towards the end of the 15th century, when Grand Prince Ivan III, "the gatherer of the Russian lands", married Sophia Palaiologina, the niece of the last emperor of Byzantium– and thus rightly inherited the symbol of his wife’s kin. The eagle succeeded another ancient Russian symbol of power, the lion. As Ivan III’s grandson, Ivan the Terrible, became the first Russian tsar, the two-headed eagle appeared on the first Russian coat of arms and the tsar’s seal. During Ivan’s reign, Muscovy annexed the Kazan and the Astrakhan khanates, the Tatar feudal states and the remnants of the Golden Horde, and began the annexation of the Siberian Khanate. Therefore in the early 17th century, the two-headed eagle began to be depicted with three crowns – to symbolize the victory over the three khanates. That is how Tsar Alexis himself, the father of Peter the Great, explained this in the middle of the 17th century. 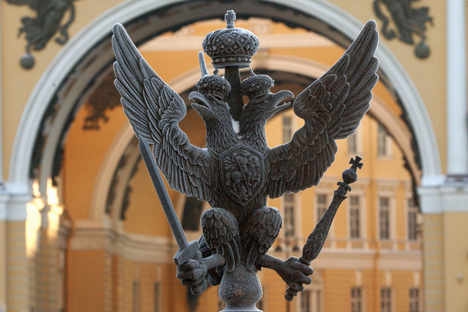 During Alexis’ reign, the scepter and the orb, which the eagle held in his claws, were also added to denote the tsar as the “autocrat and the owner of the land”. Over the centuries of Russian history, the three crowns have been assigned a great lot of different meanings. Some said that they symbolized the primacy of the tsar’s power over both the government and the church. There is also an opinion that three crowns denote the tsar’s power over Muscovy, Little Russia (later, Ukraine) and White Russia (now Belarus); or that the three crowns mean that the Russian tsar is both the sovereign of East and West… Whatever the truth may be, the three crowns remained on the coat of arms throughout the history of Muscovy and the Russian Empire. At times, other symbols were added to the coat of arms. During the Polish occupation of Moscow in 1612, the Catholic royal lily appeared on the eagle's chest. This was later substituted by St. George or by a griffon, the symbol of the ruling Romanov dynasty. According to Russian heraldic tradition, there has always been a difference between large and small official coats of arms. The large coat of arms, besides the eagle, also included the emblem of the Romanov dynasty, as well as the emblems of the most important lands comprising the Russian Empire. The Russian emperor was concurrently the tsar of Poland, Georgia, Siberia and the Grand Prince of Finland. In order to emphasize the government's Christian character, Archangel Michael and Gabriel were placed alongside the double-headed eagle. After the February Revolution of 1917, the Provisional Government removed the crowns. It is precisely the democratic "downgraded" eagle that is seen on the monetary units of the Russian Federation. The scepter and orb were also removed. During the Civil War the anti-Bolshevik powers reinstated the eagle as their coat of arms, but the crowns were replaced with the cross. The scepter and the orb once again appeared in the eagle's claws, though the emblem was living on borrowed time by then: After the Bolshevik victory the hammer and sickle was adopted as the official emblem of the new state on July 6, 1923. The double-headed eagle returned to Russia only after the collapse of the USSR and a three-year study carried out by a special commission. In 1993, following President Boris Yeltsin's decree, it was reconfirmed as the symbol of the official coat of arms. Flying in from the distant past and alighting in Russia, the double-headed eagle continues to change, as if adapting to the current political reality of its adoptive country. Vladimir Khutarev has a Ph.D. in History and is President of the Moscow City Division of the All-Russian Society for the Preservation of Historical and Cultural Monuments.